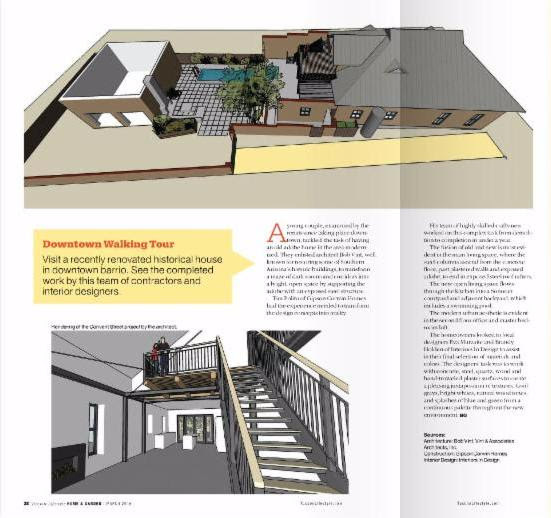 An 1880's-era adobe house, for which Vint & Associates Architects designed the renovation & expansion, was published in the March edition of Tucson Lifestyle Home & Garden. The house is located on S. Convent Ave. in Barrio Viejo; the exterior was preserved per historic preservation standards while the interior was completely re-designed to create an open, contemporary environment. The result is a contrast of old & new ~ a 21st century interior within a 19th-century adobe exterior. Vint & Associates Architects highlighted in Tucson Lifestyle Home & Garden.